Going to the dentist is something that many people dread. It gets put off over and over again, resulting in damage and disease that only a professional can treat. With that in mind, we’ve gathered five of the signs that you need to make a trip to the dentist’s office. 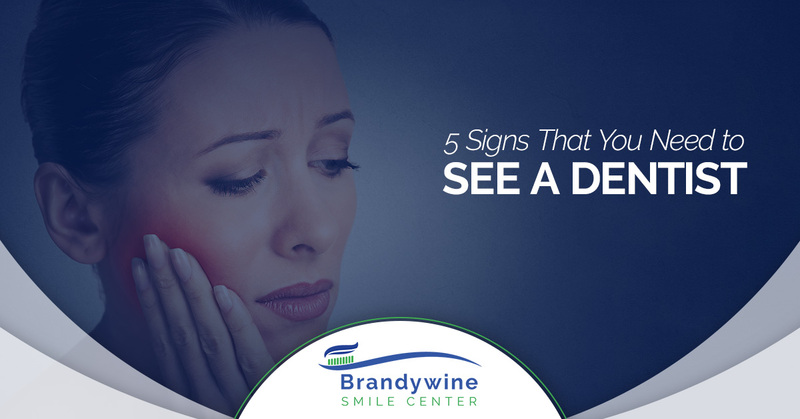 If any of these signs sound familiar to you, call us at the Brandywine Smile Center here in Glen Mills to schedule an appointment. Toothaches can be mildly painful to absolutely excruciating depending on the cause. If it’s tolerable, it’s tough to make the decision of when to see a dentist for it. If the pain is constantly there, you shouldn’t put it off any longer. If you have a cavity, it can cause inflammation in your tooth, an infection, or some other situation which will not get better on its own. Don’t put off going to the dentist for your tooth pain until it is unbearable. Get it treated before it gets worse! If you feel like you’re constantly thirsty, it may be because your mouth isn’t producing enough saliva. Saliva is important to everyone’s oral health, because it helps digest food, neutralizes acids, and even influences your sense of taste. Without enough saliva, you’re more susceptible to infections and tooth decay, and you lose the benefits it provides. Your dentist can help determine what is causing your dry mouth and recommend ways to treat it. When you brush your teeth, do you see red? If so, you might be brushing too hard, but another possibility is inflammation of your gum tissue. This advanced gum disease, also referred to as periodontitis, affects nearly 50 percent of adults over the age of 30 in the United States. While gums bleeding occasionally is not something to worry about, if it is a consistent and constant issue, it is a sign of something more serious. Other symptoms of gum disease include redness, swelling, and permanent teeth becoming loose. If periodontitis advances, it can cause other health issues throughout your body, so treating it sooner than later is important. Having bad breath after eating some garlic or drinking a cup of coffee is something we all expect. However, if bad breath sticks around even after brushing and flossing, there is likely something else causing the issue. Bad breath, also known as halitosis, can be a symptom of gum disease, a dental cavity, a dead tooth, or some other medical issue. Talk with your dentist to see what the cause could be, as well as some ways to treat pesky bad breath that won’t go away. If you have a constant feeling of pain in your jaw, it might be caused by a dental issue you’re not aware of. For instance, you might be grinding your teeth in the night without knowing it. Also known as bruxism, grinding your teeth can cause damage resulting in jaw pain. It might also be caused by a cavity, as bacteria from the cavity can get into the root of the tooth, leading to jaw pain and an abscess in the tooth if it isn’t treated promptly. Even if the pain goes away after a little bit, it’s important to get this treated by a professional sooner than later. Ignoring dental issues will only cause you more pain, so it’s important to get these things treated as soon as you can. For patients in Glen Mills, the Brandywine Smile Center is here to help keep your teeth clean and healthy so you have a smile you can be proud of. Call us today to schedule an appointment!